SEATTLE, Wash., Nov. 20, 2017 (SEND2PRESS NEWSWIRE) — HaptX Inc., formerly AxonVR Corporation, announced today its first product, HaptX Gloves, the world’s only haptic wearable to bring realistic touch and force feedback to virtual reality. HaptX Gloves feature over 100 points of high-displacement tactile feedback, up to five pounds of resistance per finger, and sub-millimeter precision motion tracking. HaptX Gloves will ship to select customers in 2018. Businesses can learn more at https://haptx.com/. Founded in 2012 by Jake Rubin and Dr. Robert Crockett, HaptX brings virtual worlds to life through the power of realistic touch. A venture-backed startup, HaptX has raised over $9 million and has 32 employees, with offices in Seattle, Wash. and San Luis Obispo, Calif.
*Photo Caption: HaptX Gloves provides realistic feedback for entertainment and enterprise users seeking training and design solutions. 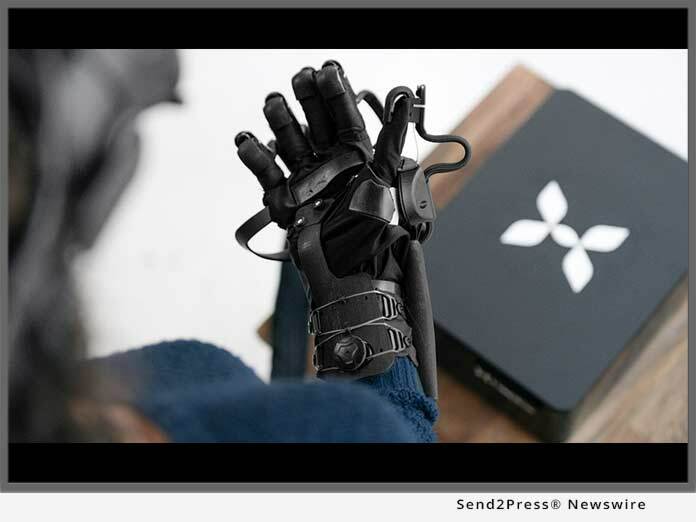 "HaptX Gloves are the result of years of research and development in haptic technology," said Jake Rubin, Founder and CEO, HaptX Inc.
RSS News Feed for HaptX Inc.